This is the Mocha Java brought to you by Klatch Coffee. 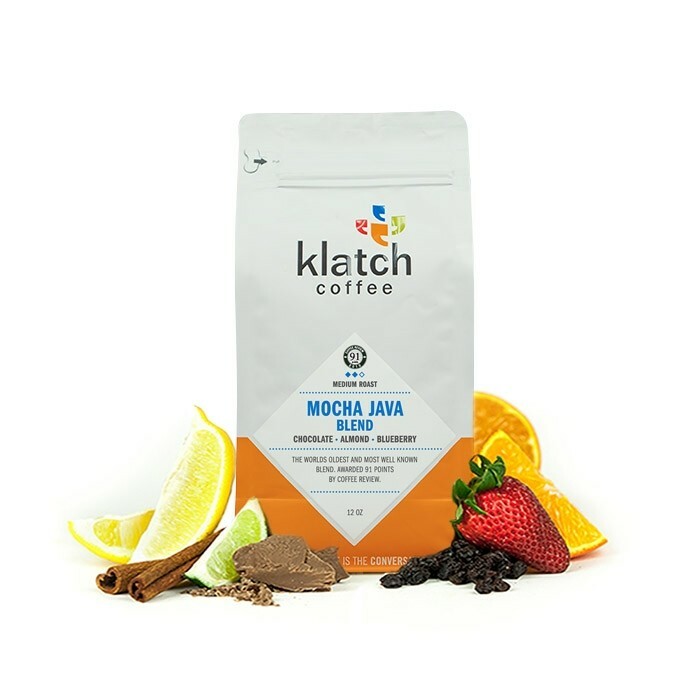 This Mocha-Java blend combines a genuine Java from the government estates of East Java with two different Ethiopia "natural" or dried-in-the-fruit coffees, both of which represent variations on the original Yemen Mocha component of the blend. In the cup are notes of brandy-toned chocolate, with a wonderful nutty almond and deeper hints of blueberry top notes. Was a bit bitter and bland for my taste. The combination of flavors didn't really work for me. Fruity flavors were far too strong. It's so rich that I can only handle .5-1 cup at a time. We brewed this coffee through our aeropress at a ratio of 24g coffee to 12g water, and found it to be delicious. This was surprising being a "typical" mocha java blend, however, it may have been one of my favorite initial tastings ever. A nice complex flavor with subtle chocolate notes. No bitter aftertaste. Was thinking it would be slightly more on the chocolatey side, being called a "mocha", but still a great cup of coffee. Did not like aftertaste at first, but grew to like the brew. Not a great hit at first. Would not order again, before trying other offerings. A little confused by this one. I ordered it for the earthy/chocolate notes, but I get a lot more of the blueberry than the other flavors. Maybe because that flavor is so distinct from the other coffees I've had that it stands out to me more than it should? Its good, its just so far off from what I was expecting based on the description and reviews it almost feels like I got the wrong bag. The first cup was so good, I almost was unable to get to my computer before it was gone. Full of flavor, great when brewed both at a coarse or fine grind. Flavor does change a lot though. This roast did not turn into a powder when I used my hand grinder. This was like listening to Bach on a harpsichord. OK. i am not a coffee connoisseur. i will admit that right up front.
. i didn't find this coffee earthy chocolaty or balanced. i think it tasted sort of like a flat dark beer. my wife says it had a whisky/ hard alcohol over tone to it. i am sure some one will like it , but we did not. BTW we tried areopress,chemex and a drip maker. also several different grinds.